House Type – “LE LOGIS DES CARADAS” (The House of Caradas) illustrates one of the historic French timber construction techniques. This method is found predominantly in bourgeoisie town houses. It is characterised by various types of infill between the timber sections, the use of jetty structures and is built over several floors. Two types of infill may be found here: wattle and daub (sticks and mud) and fired bricks. There are also hidden timbers, over-rendered with earth, plaster, lime etc. In fact, in France, many older buildings are, unexpectedly, made of wood, even in Paris. The foundations of these houses are usually built in stone and play an important part, both to support the weight of the structure as well as protecting the timber from rising moisture. The ways that the connections between plinth and timber frame are made, is of great importance for the longevity of a timber building. The Climax of Timbered Buildings – It is difficult to date the appearance of the timber framing in France, but by the fourteenth century they became widespread and were found in Alsace, Aquitaine, the Ardennes, Bresse, Brittany, Normandy, the Landes, Sologne, in the Basque Country and in the Île de France. This timber frame building technique is based on the principles of minimising the use of materials, achieving a lightweight form of construction and ease of implementation. The cantilevered overhanging jetty protects the building facade below from rainwater, and also increases the interior living space. 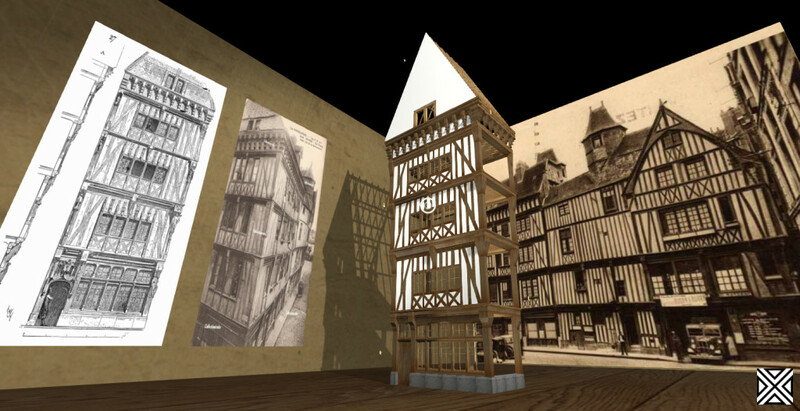 In Normandy, timber framing, especially using oak, was the preferred method of house building. Oak forests dominanted the landscape in Normandy until the twelfth century, but the woodland area declined with the expansion of agriculture, the growth of the navy and the increasing the number of iron forges. This quickly led to a decrease in forest area, which led to a concern about their over-use and future management. The timber-framed building naturally found its place in the search for a material economy associated with the resource limit wood of great length and large diameter. This technique of short wood/colombes allowed the use of smaller section and length timbers. This system enabled the development of corbels. The house of the fifteenth century was characterized by a facade with peices of wood arranged in boxes which redistributes the weight, bracing provided by the cross of St. Andrew on either side of the window, with the discharge ends of the intermediate floors and vertical poles together. The floor was built corbelled, loading the ends of the girders, it corrected the sagging effect. It also corrected by increasing the section of the beams and adding brackets. The jetty possible both to protect the facade runoff of rainwater and increase the living space. The colombes dividing walls of each floor had a supporting role but also an aesthetic role. Advantage Of Jetty Structure – This technique allows the building to be raised to a greater height and also provides more upstairs living area without increased property taxes which were based just on the ground.floor area! “Joists standing on beams” is a more primitive approach. The timber beams are set out to cantilever with a short overhang over the lower frame . On to these protruding ends are attached the frame of the upper floor. This simple form of jetty (corbel) is the oldest.